NEBRASKA CITY, Neb.–Aria Rose Claspill, a fifth-grade homeschooled student from Las Vegas, is the Nevada state winner in the 2008 Arbor Day National Poster Contest. The sheep are back grazing cheatgrass in the hills of Carson City, Nevada. Ann Bollinger from Carson City Parks and Open Space discusses the grazing project and how targeted grazing can be used to help manage invasive weeds and protect homes from wildfires. (Mohave Daily News, JIM MANIACI) LAUGHLIN, Nev.–Just in time for two of Laughlin’s biggest tourist-attracting events, Nevada’s Big Bend State Recreation Area has opened its multi-million dollar recreational vehicle campground. 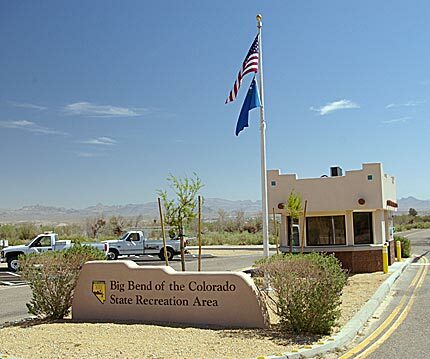 And park supervisor Alan Conklin is especially proud that Big Bend is the only Nevada State Parks Department RV campground with all of its spaces offering full-service hookups. He hopes this weekend’s Dodge Extreme Bulls competition will bring in a good crowd and fully expects to be booked to capacity – he actually said last week it easily could be more than capacity – for the 26th Laughlin River Run motorcycle event April 23-27. “Officially we opened the campground three days before one year of construction. It took us a little bit longer than we thought,” he said, but added that change orders for extra work caused some of the delay. Overall, including consultants and planning, Conklin said the state is spending $7 million on the project. 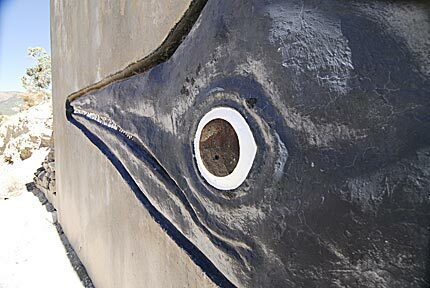 GABBS, Nev.–The heavier than normal snow accumulation has melted, allowing Berlin-Ichthyosaur State Park to re-open the park’s main attractions. The park’s Fossil House is now open for scheduled tours on Saturdays and Sundays between 10:00 am and 2:00 pm. The campground is also open and normal park fees will be charged. The Diana Mine tours are still suspended until further notice, pending a thorough assessment of the mine’s safety. The Nevada Division of Forestry and Storey County Fire Department held a controlled burn yesterday in Storey County’s community of Lockwood. Click the image to view the slideshow. With the choke of a drill’s carburetor and a whiff of gas, the workers on a south facing slope in Ash Canyon went to work–digging, boring holes and planting. “Yeah, you know it’s a nice day when you do this for a living and there’s no place you’d rather be,” said Nevada Department of Forestry Fire Captain Joe Fording, who this week and next will help supervise more than two dozen crewmembers slated to plant some 7,500 Jeffrey pine seedlings on 40-plus scarred acres ravaged by the Waterfall fire in July 2004. You are currently browsing the Nevada Dept. of Conservation & Natural Resources News blog archives for April, 2008.